sandwiched between Capitol Hill and the Central Area. 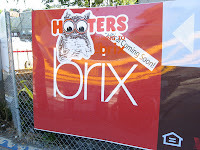 On Thursay night my wife reported having seen signs on the Brix condominium project on Broadway (where the old Safeway was) indicating that Hooters was moving in there! On Friday morning I took pictures of the signs and posted them on the Capitol Hill Yahoo group and sent them to some newspapers. The results included articles on the Seattle PI Big Blog and in Saturday's newspaper, and an extensive discussion on the Stranger's blog, all of which figured out that it was in fact a hoax. The Stranger's blog posting generated an huge number of comments, with a wide-ranging discussion that including speculation on where the gay center of Seattle now was (the Central Area, they speculated), the location of good gay bars there, and whether Thompson's Point of View could become a gay hangout! - With only ONE retail space of 820 sq. ft. remaining, you can pretty much rest assured that whomever DOES take the space will have a minor retail presence.